As one of the other supporting pieces is the front cover of a film magazine, I am now going to be analysing different titles such as Empire and Total Film to get some ideas of how they are set out and the types of headlines that are used and appropriate for a film magazine. 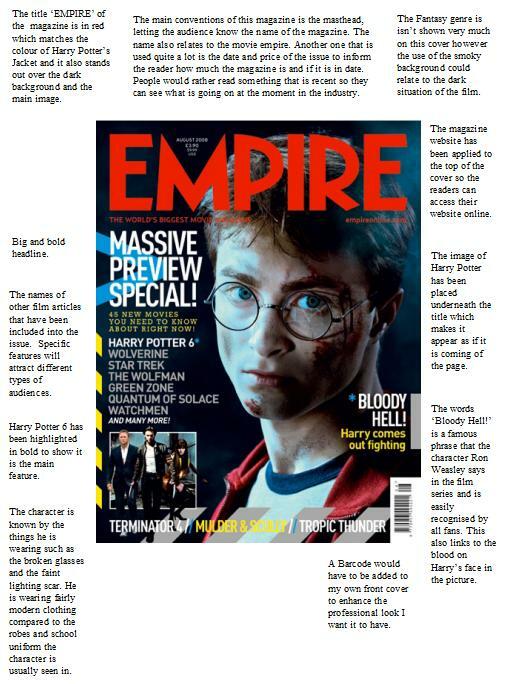 Empire is a British film magazine published monthly by Bauer Consumer Media. It is the biggest selling film magazine in Britain, consistently outselling its nearest market rival Total Film by over two-to-one. It contains film news, previews and reviews and sometimes has some unique regular features. Firstly I have an example of a Harry Potter front cover, I have labeled most of the key things that I can see and how they impact the reader. I have also looked at the clothing and if it is relevant to my chosen genre.